According to a report by the Hoboken Resistance & Advocate, today's NJ transit hearing to approve the purchase of the Union Dry Dock for use by NY Waterway is suspended. 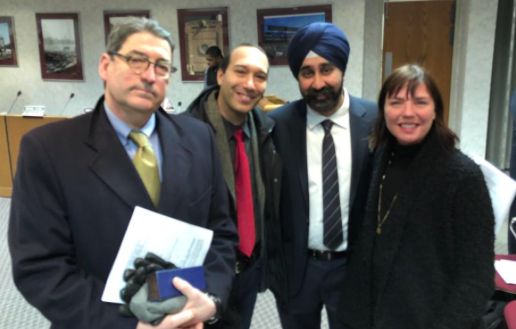 Almost 100 members of the Hoboken public joined Mayor Ravi Bhalla with Council President Ruben Ramos and council members Tiffanie Fisher, Jen Giattino, Vanessa Falco and Jim Doyle united in opposition to the NJ Transit plan to purchase and give NY Waterway use of the location. Former councilman Dave Mello also joined the effort. Tomorrow, the NJ governor-elect Phil Murphy will be sworn-in taking office as NJ Governor. With his term, Murphy will play a pivotal role in attempting to fashion a solution to the conflict. NJ Transit wants to purchase the property and "sell" its use to NY Waterway so its 30,000 boat customers can see their vessels refueled at the site of the Union Dry Dock. The town of Weehawken is pushing NY Waterway off their location for development and a refueling pitstop is critical for continuing its business operations. Some in Hoboken point to Bayonne or Brooklyn as "better" refueling depot options but the additional travel time and fuel consumption is costly. Additionally, it adds to pollution and the output of carbon which some argue causes global warming climate change. The news on Martin Luther King Day shows the unity of almost 100 Hoboken residents who turned out joining Mayor Ravi Bhalla with council members Tiffanie Fisher, Jen Giattino, Ruben Ramos, Vanessa Falco and Jim Doyle may have had a positive impact. No matter the result here which Hoboken does not ultimately control, the unity of its local government proves there is no reason for discord where the agenda of the residents is primary and leadership for Hoboken is held paramount. and Jim Doyle at the NJ Transit meeting Monday morning. Council members Tiffanie Fisher and Vanessa Falco not pictured here were also in attendance. The NJ Transit agenda was tabled meaning the matter of Union Dry Dock's purchase and future use will be further weighed under the pending NJ governor-elect Phil Murphy Administration. Talking Ed Note: Mayor Ravi Bhalla utilized the support from residents and council members alike in a strong show of force and unity. No matter what transpires on this issue, this is a positive sign of how Hoboken's local government can effectively work together. There's no reason to expect anything less.